Ladbrokes is offering new customers the chance to claim an insane enhancement for the Champions League Final on Saturday night. FInd here how to claim 40/1 on a goal to be scored during Real Madrid v Liverpool + £5 free bet should the match end in a goalless draw! Claim this unmissable offer in less than two minutes, it's very simple. 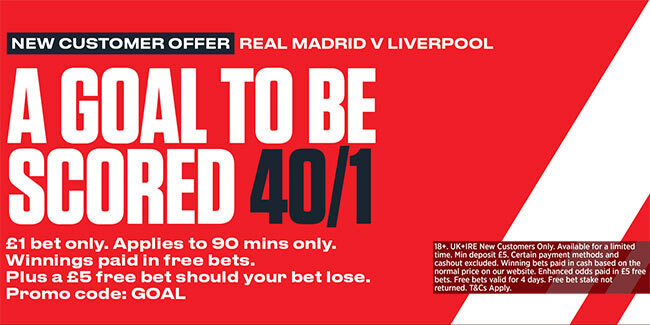 Join Ladbrokes via our special links and claim 40/1 for ANY goal to be scored in Real Madrid vs Liverpool! 3) Place a single bet of up to €/£1 on ANY goal to be scored in Real Madrid vs Liverpool before the kick-off. 4) If a goal is scoredin regular time, your account will be credited with extra winning to make payout equivalent to enhanced odds within 24 hours. 5) If the match ends 0-0 (extra-time excluded), Ladbrokes will credit your account with a £5 free bet! Ladbrokes offer 40/1 A goal scored in Real Madrid vs Liverpool + £5 if you lose! These two teams have the most powerful attacks in Europe as they have already combined for 70 goals in this season’s Champions League. There have been over 2.5 goals scored in 9 of Liverpool's last 10 games in Champions League. The Reds rattled four past Roma to take their tally for the UCL season to 40, ten goals more then their nearest rivals Real Madrid. Real Madrid have conceded 6 goals in the last three UCL fixures while Liverpool have conceded 6 goals in the two semifinal games against Roma. "UCL Final 40/1 ANY Goal to be scored in Real Madrid vs Liverpool with Ladbrokes"